of me. I’d like to take a nap. Let me slip into a life less messy. Let me slip into your sleeve. and the lost crow. It’ll be rich. can’t boast of the meal. Read An Interview with Ada Limón on our blog. 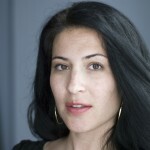 Ada Limón is the author of three collections of poetry, Sharks in the Rivers, This Big Fake World, and Lucky Wreck. Her work has appeared in numerous magazines and journals including Harvard Review, TriQuarterly Online, Poetry Daily, and The New Yorker. She has received fellowships from the Provincetown Fine Arts Work Center, the New York Foundation for the Arts, and won the Chicago Literary Award for Poetry. She is currently a judge for the 2013 National Book Award in Poetry and will join the 2014 faculty for the low-residency MFA-Latin America for Queens University of Charlotte. She is currently finishing her first novel, a book of essays, and a fourth collection of poems. She works as a writer and lives in Kentucky and California.